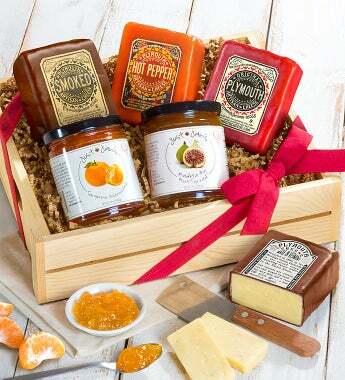 We've created this truly superior taste experience by pairing Plymouth Artisan Cheese, producers of original American Heritage Cheeses in Plymouth Notch, Vermont since 1890, with Just Jan's All Natural Fruit & Savory Spreads. Just Jan's is nestled in the foothills of California's Santa Monica Mountains. These award-winning cheeses and spreads will wow even the most sophisticated food connoisseur. Featuring Signature, Smoked and Hot Pepper Cheeses and Kadota Fig and Tangerine Marmalade. Plymouth Cheese Factory is the 2nd oldest cheese factory in the US. It was founded by the father of President Calvin Coolidge and is still in its original location on the Calvin Coolidge State Historic Site in Plymouth Notch. This historic company produces artisanal raw cow's milk cheeses with milk received from a single local herd that is continually monitored for quality. All of their milk comes from a farm that engages in the best dairy practices and humane treatment of their livestock. Only the finest and freshest milk goes into their cheeses. is rounded out with notes of butter, fruit and nuts. heart and high in natural sugars - there are only 8 grams of sugar per serving. shine through. This unique tangerine marmalade can brighten up your morning toast, or even liven up your evening cocktail.